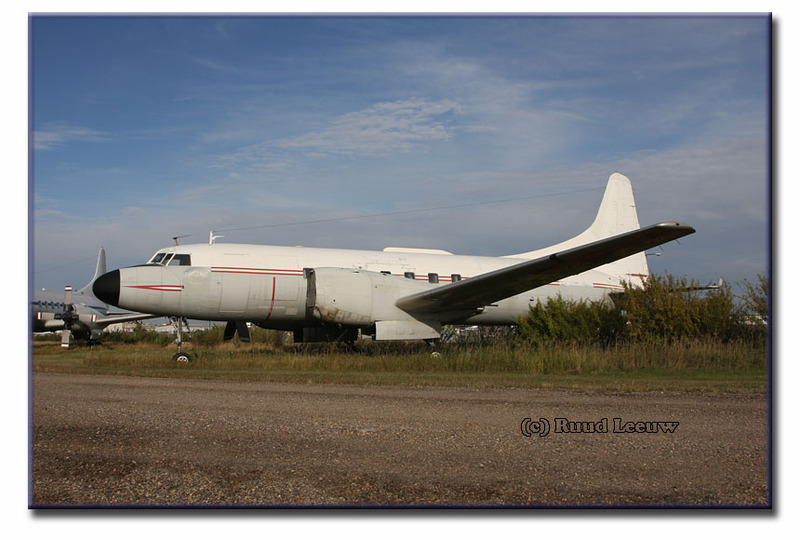 On my way back from Alberta to Manitoba, I decided to drive via Saskatoon for 2 reasons: to have a look and possibly photograph 2 Canadair CL-66s at the airport and to meet Cory Rousell, with whom I had corresponded about his personal initiative to preserve a Classic Aeroplane. But first: the stored CL-66's. This page shows photos taken on 25Sep07. 'Final' update, sent Jan.2013 by Al Furneaux, can be found at bottom page. 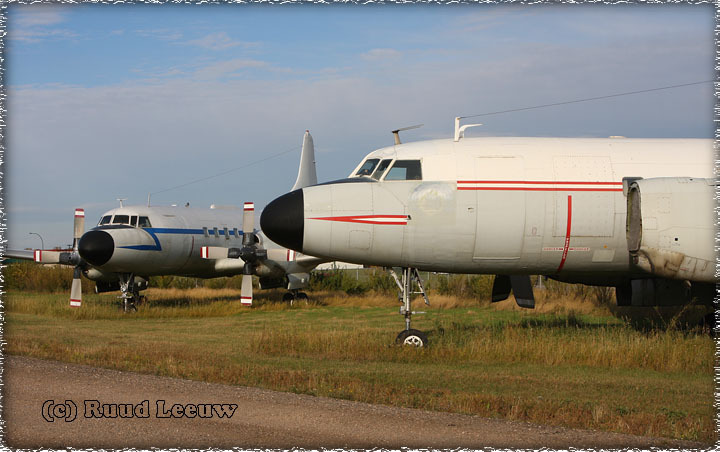 These CL-66B's have been stored here at Saskatoon Airport for a good many years now. Both served with the Canadian Air Force under designation CC-109. The Canadair CL-66 was a turboprop version of the civilian Convairliner. 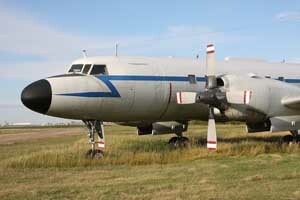 The CC-109 Cosmopolitan or 'Cosmo' in RCAF service became the standard VIP aircraft, as well as replacing the Douglas DC-3 Dakota and the North American B-25 Mitchell in light transport duties. It would have been logical to have seen these aircraft move to 'civvie street'. There is a story to that. This CC-109 was registered with the RCAF initially as 11152 and later as 109152. 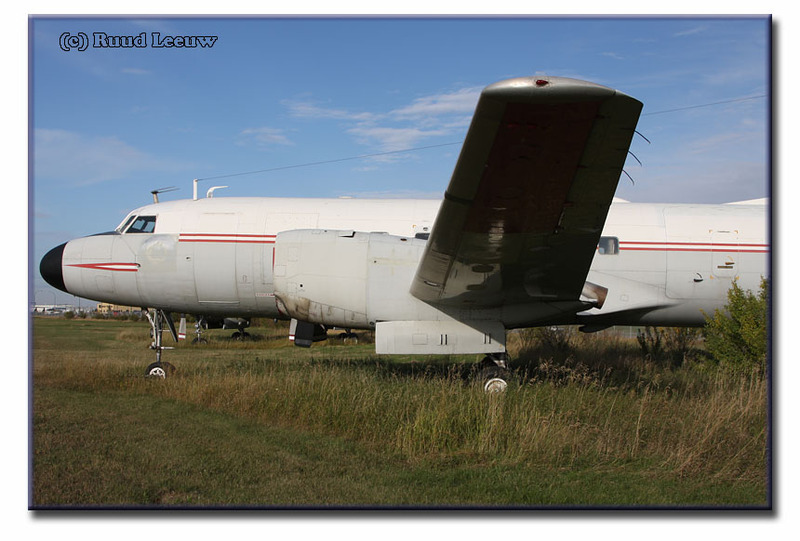 It was bought by one Terry Holowach (some sources quote the name 'Terry Hollowich'; more on/by him below) and tailnumber C-FNCL was reserved for 'North Canada Corporation'. But this never came to fruition. There is no sign of a C- number on its airframe. 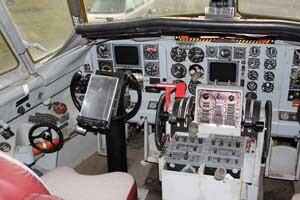 When it was advertised for sale in Dec.2002 by Globalair, it showed 18.860 airframe hours. 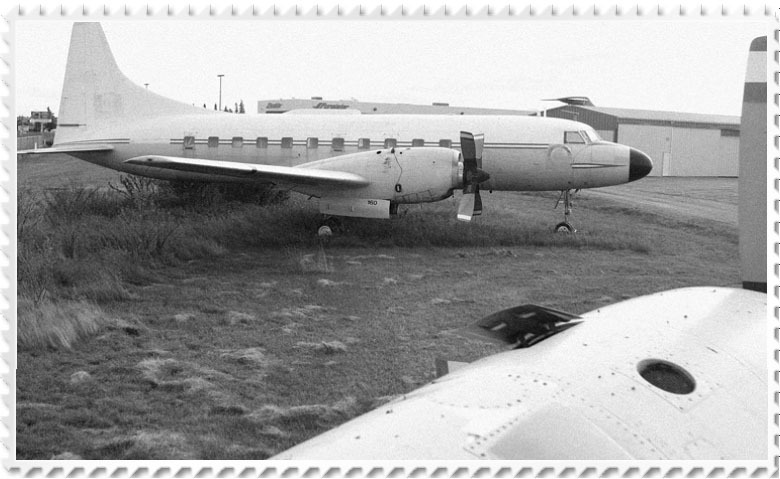 A few words on its history: Canadair CL-66B-2 was delivered to RCAF in April 1960 with tailnumber 11152 assigned; it was converted to CV580 standard (which included replacement of the unsatisfactory Napier Eland engines by Allison T-56's) in 1966 and redelivered, to 412 Sqdn; registration 109152 was assigned on 26May72; it came to serve with 1 ATU in May 92 and it was decommissioned in 1994; it became registered to North Canada Corporation on 15Oct96, but this was cancelled that same month. 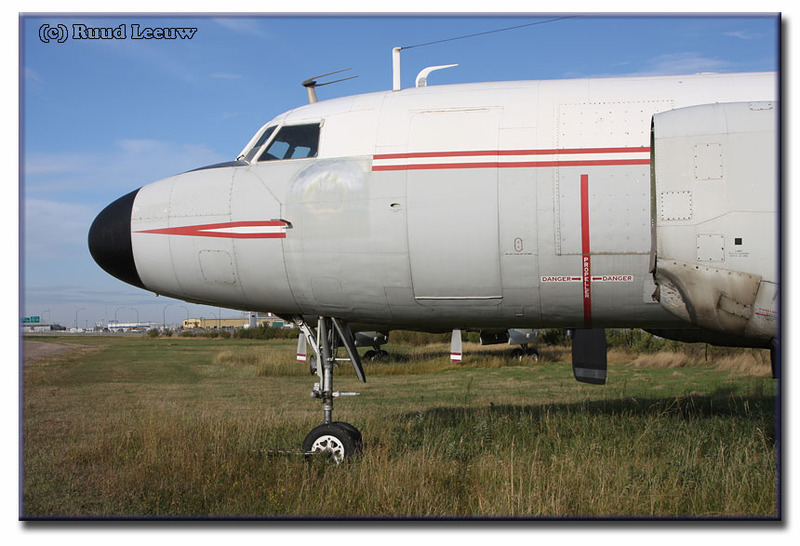 A visual reference for a Canadair CL-66B 'Cosmo' is the HF antenna 'bump' on the fuselage; not a common feature on a regular ConvairLiner CV580. Al Furneaux explained: "The 'no.2 ADF sense antenna' is located in the Hump on the upper fuselage. 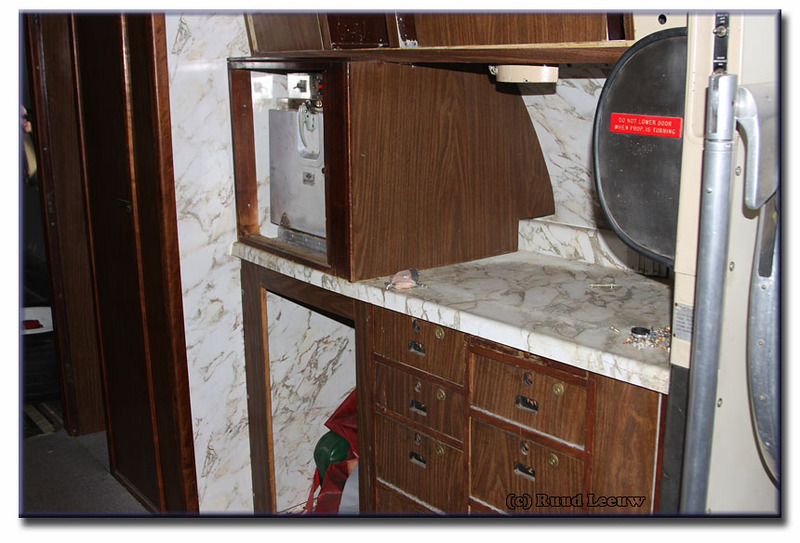 The HF antenna is a long wire, as you can see in your first photo of 160 & 152." It all started when a Cosmo flew to RAF Waddington (my local air base..) to support a detatchment of F-18s, in place of a C-130. Got me thinking this must be the last military propliner still in Europe! The USN C-131s had gone, French Flamants and Noratlases had gone, etc. etc. So, a letter to the Canadian Embassy and some telephone calls and it was all arranged. 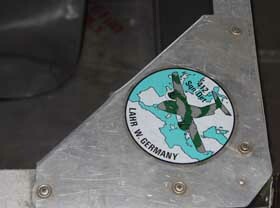 Lahr to Sollingen it was, positioning flight for some crew training, then following day from Lahr to RAF Northolt (London), on one of her regular 'feeder' services the type carried out around Europe .... ah, so sadly missed! The Cosmo was a wonderful aeroplane and '152 was absolutely immaculate inside, akin to a corporate jet, only with a MUCH better sound ! Some of Graham's air-to-air photography can be found on this website. With the close of production of the Convair CV440 in San Diego, Canadair acquired the rights to the design along with the jigs, tooling and even three unsold 440s. 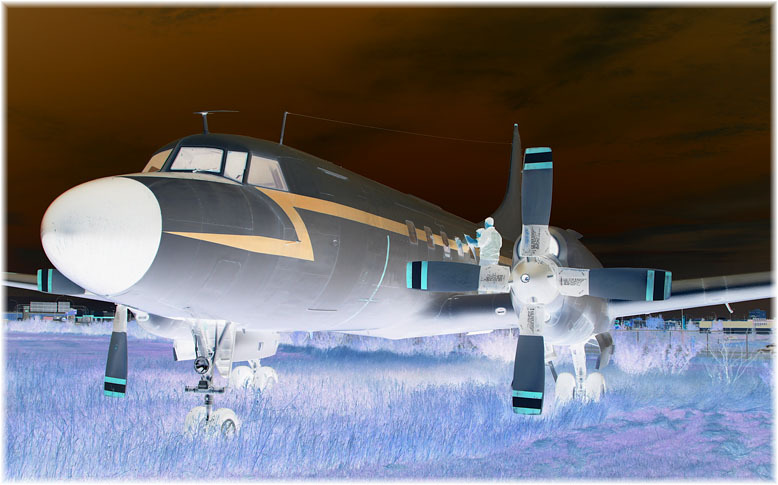 With the availability of a Napier Eland turbo-prop conversion, the re-engined CV-440s became the CV-540, an all-cargo variant. 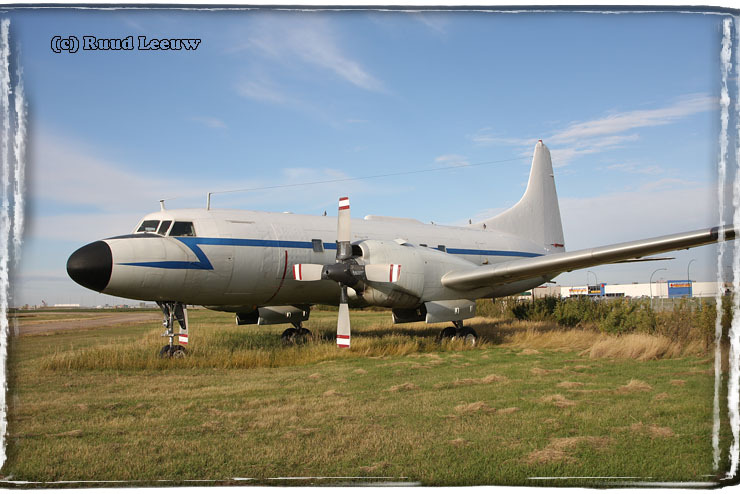 In 1958, the RCAF wanted to replace their aging C-47 Dakotas with a turbo powered aircraft. 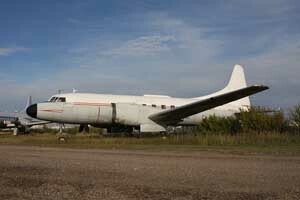 Their choice was the Vickers Viscount, but the Canadian government decided against this aircraft. Instead, Canadair offered a series of CV-540 variants powered by Napier Eland turbo-props. The project was given the number CL-66 and three versions were considered. The CL-66A was to be a 48/64 passenger aircraft. The CL-66B designed to be a cargo/passenger configuration with a payload of 14200 lb. The CL-66C instead of being built by Canadair used the Convair-built 440s, having only their new engines fitted at Canadair. The first CL-66 to fly was a 'C'-version with its first flight in February 1959; the CL-66B had its first flight in January 1960. No 'A'-versions were built. One can see how this design fits the VIP-configuration.
' 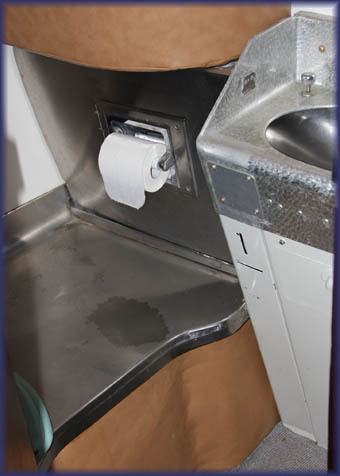 Roomservice' forgot to place a new roll but everything else is spotless..
Canadair was not able to get contracts from any major airline for the CL-66. It was too expensive and other similar types had better performance. The two aircraft, both of them CL-66Cs, that had been used for extensive sales demonstrations, were sold to the local carrier Quebecair. The RCAF took ten aircraft, mainly Bs. The Eland not only proved to be unreliable, but also did not deliver the expected power, consequently, the RCAF instituted an engine upgrade in 1966-1967, installing Allison T-56 engines. After eight airframes had been re-engined, the company phased out further development work on the type, 'orphaning' the remaining final two Eland examples, which were subsequently scrapped. No. 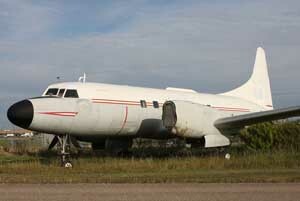 412 Squadron at CFB Ottawa flew the Cosmopolitan from 1960 to 1994, as VIP transport. The CC-109's were also deployed to Europe for Canadian NATO contingent support, as well as to the US in support of Canadian NORAD operations. It seems these Canadair propliners were part of unsavory dealings! 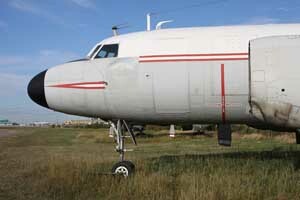 At some point in time a Crook convinced a Business Man that the decommissioned CC-109 Cosmopolitans, stored at Saskatoon, were worthy of investment. How could they not be: low-time Turbo Props, pampered VIP-aircraft, capable of operations in both passenger as well cargo configuration and meanwhile their 'cousins' the ConvairLiners were proofing their continued use all over the world..! So the Business Man wrote out a cheque and bought these fine aircraft. 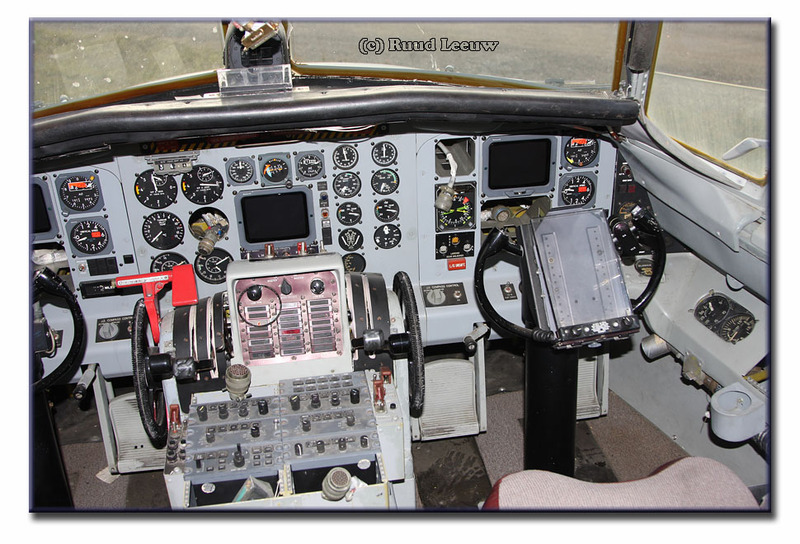 Unfortunately, the Canadair CL-66B's were only certified for military use: an undeniable handicap. But the Crook had a plan: to sell these aircraft to countries where there was less Governmental oversight and where operators considered 'a good aeroplane = a good aeroplane' and did not become distracted by mere paperwork. Countries in Africa and Latin America come to mind. The Crook did not share this plan with the Business Man. So these aircraft were ferried across the border. The Business Man sat in his office and did not notice. 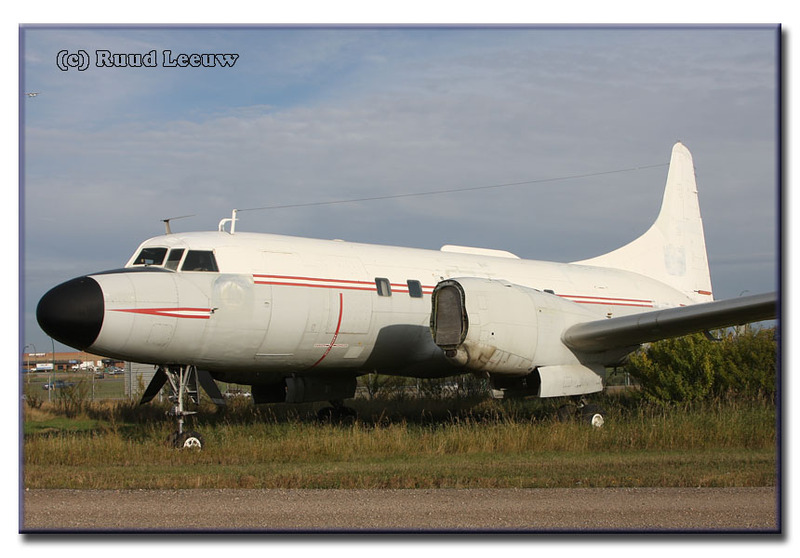 Until Authorities noticed... and apprehended the Crook in Calgary, where CL-66B (c/n 1) C-FNCI still sits, languishing in storage (meanwhile, reregistered N4AX). The Business Man died. His remaining Cosmo's remained unsold. The Widow entertains as yet no plans for use of these forgotten VIP-transports. True or False..? I don't know.., I merely bring to the surface what was related to me. Comments will be welcomed. 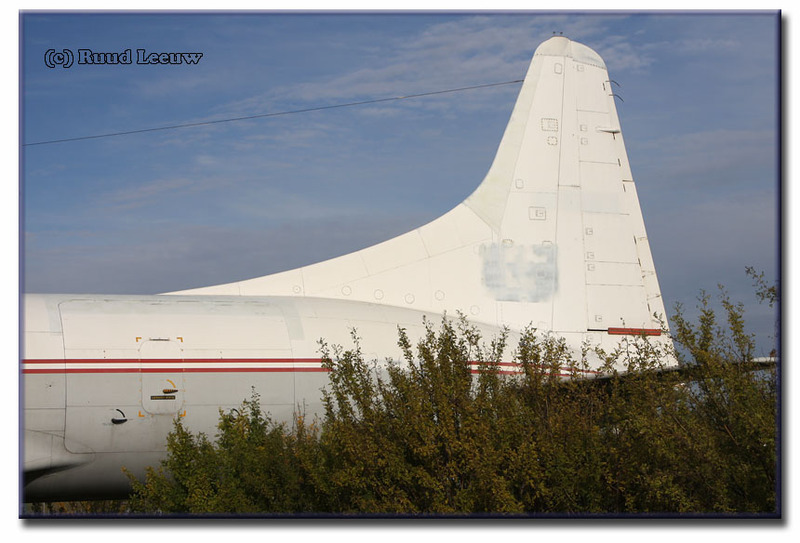 While CL-66B-1 is accounted for, in Calgary, we have have c/n 2 (C-FNCL) and c/n 10 (C-GNCM) here at Saskatoon. C/n 3 was destroyed by fire in Montreal April 1967 (CAF 11153). 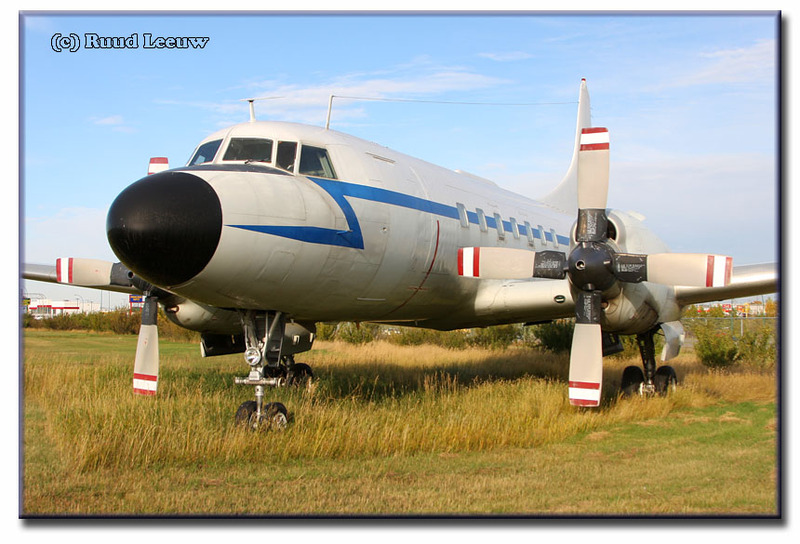 C/n 4 (C-FNCT) found its way to Africa (reports of sightings/registrations in the Congo, South Africa and Rwanda) and after operations & storage in Panama (HP-1468APP), anno 2007 it is in Bolivia (as FAB-74). See more info further down this page. 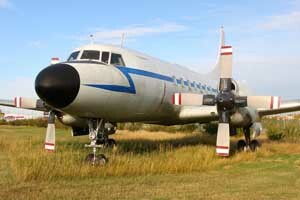 C/n 5 was broken up in 1972 (CAF11155). C/n 6 also found its way to Africa, with reports from Rwanda, South Africa and Swaziland; last reports stem from the Democratic Republic of Congo (DRC). Destroyed while used by private operator in Swaziland ex 3D-ZOE (owner quoted as Ken Hamilton of Canada). C/n 7 went from tailnumber C-FNCW to the US Registry as N4FY and is currently HP-1445AP in Panama (stored by Aeroperlas). C/n 8 fell victim to the scrapman in May 1972 (CAF 11158). C/n 9 also ended up in Panama (HP-1473) and was seen stored at Panama by Aeroplerlas, 28Nov07,	though reregistered to Venezuelan Registry as YV-192T since early 2007. Updates & Reactions Welcomed ! Terry Holowach was the name I was given to get info on the Convairs, he was selling them on behalf of the owner whom I now assume is the widow you mention? Terry is a CL215 pilot, so was away when I made my visit"
The name Albert Ethier in connection with CL-66B's also comes up in a -Spanish- article, which also includes a link to some video footage of a CL-66B whilst landing somewhere (if you can stand the 'soundtrack'). The name Alaskin Air Service was also mentioned in connection to Mr Ethier, but have been unable to trace any details. I received following in defense of Mr Ethier: I am, or more correctly , was familiar with these aircraft. I wil give you my best recollection. First: "Albert Eithier(sp) was involved with NorCanAir many years ago. I won't go into the history there except to say it was sold to Time Air and Albert signed a non-compete clause. When that expired, NorCanAir was resurrected (this is not the legal name) and ran into some difficulty with Transport. Was shut down. Albert subsequently bought the aircraft pictured, I believe in about 1989-1990. He had a partner, one of the Remai brothers, in Saskatoon. I can not remember which one, but I think it was Frank or John. Plan A was to get them certified. Did not happen. Plan B was to sell them to a foreign government or a foreign carrier who did not require , or maybe care, about the C of A.
I left about that time and lost track of what happened. They were great old birds. My personal opinion is that Albert Eithier is a fine man. He gave me some great breaks during my career, for no other reason than I was a pilot trying to get ahead. I think maybe the whole businessman and crook thing is a little out of whack." "It was a pleasure reading about the Cosmos on your website, but it does contain a few errors, which I can shed some light on. I will attempt to give you the short version. In general terms, I would say "A Strange Tale..." captures the big picture somewhat accurately, but The Crook did not export the aircraft out of the country in secrecy (there is a great deal of paperwork to confirm that) and also The Business Man (and later The Widow) knew where they were going at all times. Its just what happened after the aircraft left the country that the owners were not kept informed about. He began to recieve telephone calls from operators in countries around the world whose air laws still entertained the civil certification of ex-military a/c, again based on the strength of their military history. Drawings, x-rays, RCAF maintenance logs, Innotech and Kelowna Flightcraft depot level inspection reports, and complete sets of manuals and supporting documents were sent to the aviation authorities in those countries for diligence. 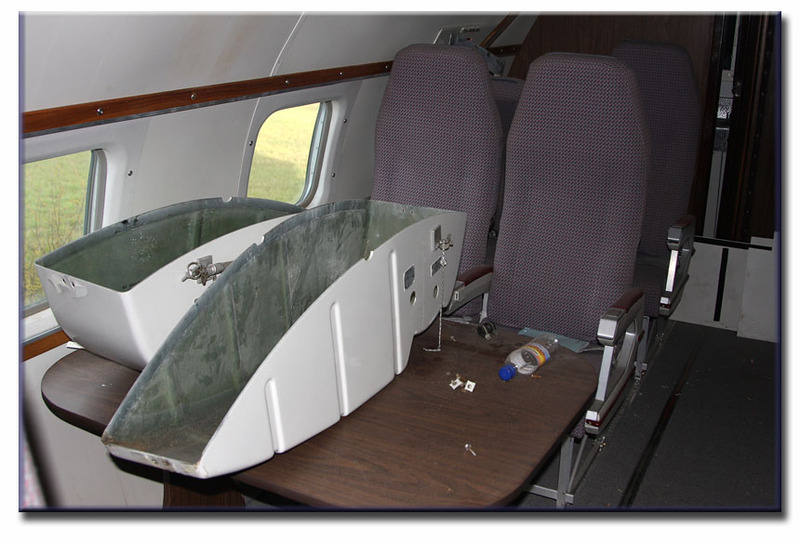 The drawings and documentation showed details such as that the addition of a cargo door, a re-enforced floor, ungraded brakes with anti-skid systems, long-range fuel tanks and a 5-tube EFIS system. 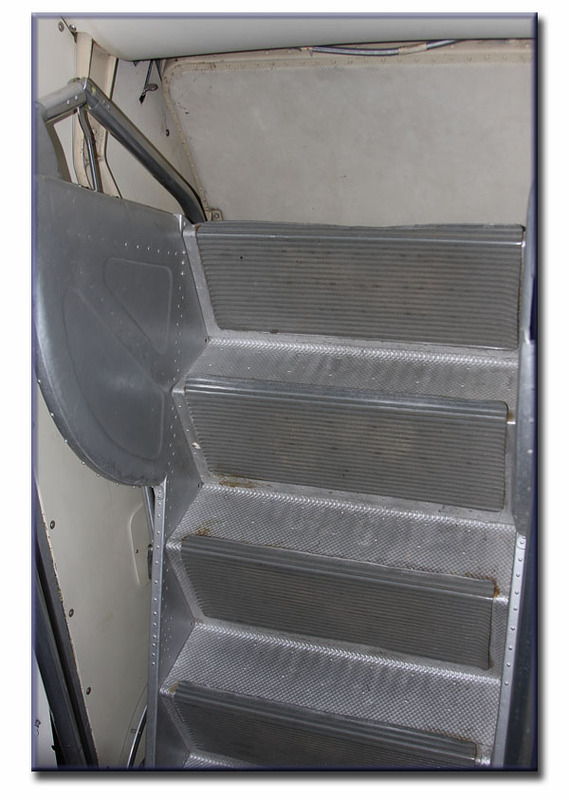 This was all implemented on a military airplane built to the same specifications as a Convair 440. Relative authorities were convinced that this aircraft would not be a hazard to public safety and they subsequently granted waivers to address these differences between a CV580 and a CC109, designating it a CV580 Variant, and issuing a civil certification! The military engines were also addressed and a sensible plan was develloped, with support from an approved Rolls-Royce/Allison overhaul shop in the USA. This solved the issue of the engines. One must take into account, however, that this waiver-type certification is the perogative of any sovereign nation, and that this initial certification was issued by a country whose aviation standards only satisfied a Category II quality. Two aircraft went to Africa and one to Central America, namely Panama, where it was operated by Aeroperlas, and used to service a FedEx contract. It flew for almost 2 years with close to 99 percent reliability. One of the African airplanes and another from Canada, was flown to Panama to join up with it's sister to resume an active life. But Panama went on to obtain Category I status, and as a result three of the Cosmos, as a condition of Category I is that commercial aircraft registered within the country must have a civil type certificate! So, under the same conditions as Canada, the Panamanian-registered Cosmos were grounded again with no foreseeable future. One of the airplanes remained in Africa. In the meantime, The Crook continued to misrepresent his relationship with the Cosmos. While the first aircraft was in Panama flying for Aeroperlas/FedEX, he did not bother to tell The Widow that the aircraft was making revenue, nor did he forward any of the proceeds... The Widow thought: why keep the airplanes if they have no revenue potential and cost so much just to park?, and so she listed them with Globalair for sale. Shortly after The Crook succeeded in getting the aircraft leased & operated by Aeroperlas in Panama, he decided to sell a percentage of the aircraft, with a promise of a "piece of the action", for a sizeable downpayment. So now he would earn money from leasing the aircraft plus the proceeds from the sale of a large percentage of it! When a New Participant bought into the "airplane and the action", but never received the agreed returns on his investment, he contacted The Widow for clarification. She called The Crook into her office, reprimanded him severely for his morals and ethics, and banished him forever! But now that The Crook was sent packing, The Widow had no one to help with her airplanes and she asked the New Participant to help her. The New Participant, not realizing his reputation would be associated with The Crook's, but with some hope to recover some of his money lost in this deal, went along with this. There is presently no intent whatsoever to demilitarize the Cosmopolitan. It cannot be done anyway. I have had this discussion with Kelowna Flightcraft, who, as the Convair 580 type certificate holder, is the only entity who could possibly do so, and they are not interested. I told you I'd give the short version..! Look for my book some day. If you know of any ghost writers to help me write this story, pass them on please!" "On all CC-109s not being able to get a civil certificate, I have to disagree with Mr. Holowach. 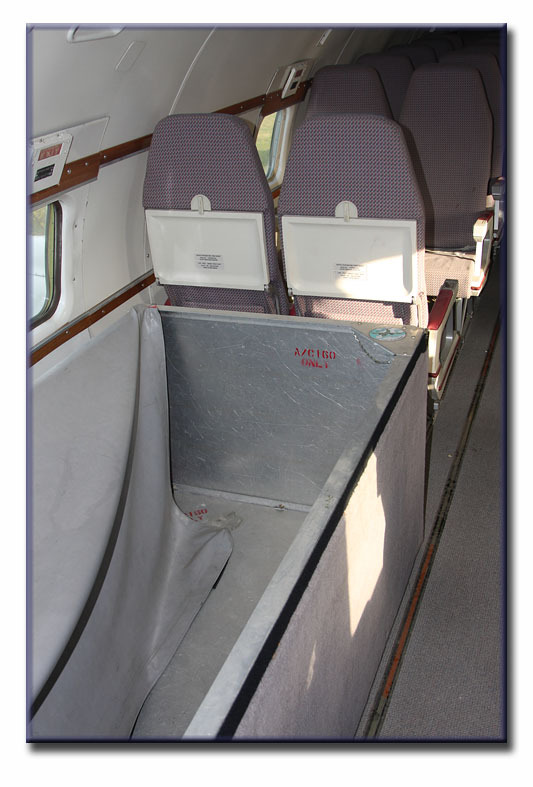 Only the former CL-66B’s have this issue. The CL-66C's, like N582P (c/n 475, RCAF S/N 11161), went to Canadair with civilian type certificates already and the modifications made did not preclude them from being used in civilian service. N582P, in particular, is still flying daily out of Miami or Puerto Rico (depending on the rotation) on a FedEx contract. 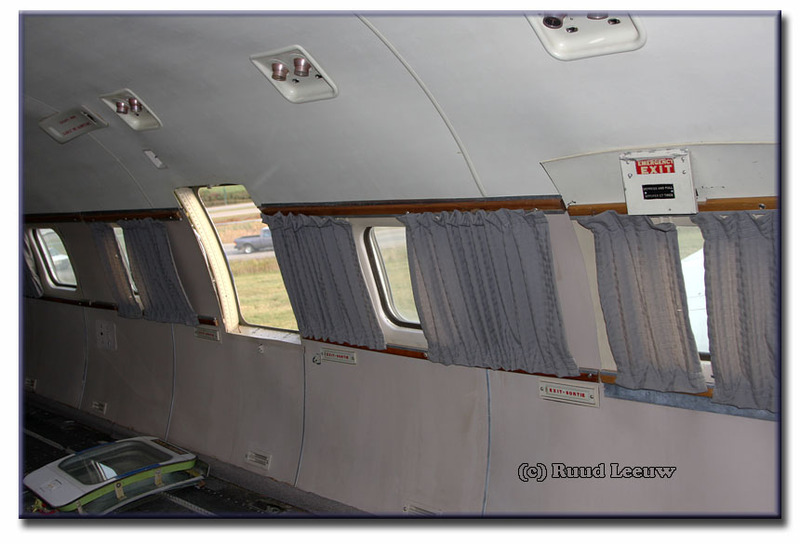 Any airplane can be converted and receive a civil type certificate, if those wishing to convert the aircraft want to go through the time (not necessarily expense) of making the conversion and having it approved by the agency involved. For example, the T-29 & C-131A (CV-240), C-131B-E (CV-340/440), and C-131H (CV-580), all have approved conversion programs through Kelowna Flightcraft and become CV-240-27s, CV-330/440-27s, or CV-580s after the conversion. This is not an STC. An STC approves modifications to an already certificated aircraft. 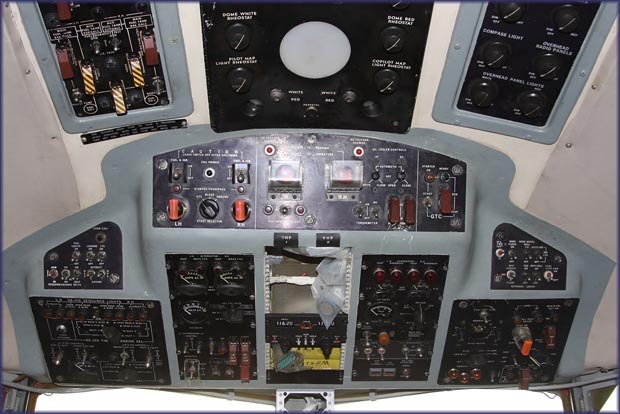 For example, there is an STC that exists for the addition of an EVSI & TCAS on all of the ConvairLiners to gain compliance with the new FAA regulations requiring TCAS to be installed on all aircraft operating as part of a Part 135, 121, or 119 airline." 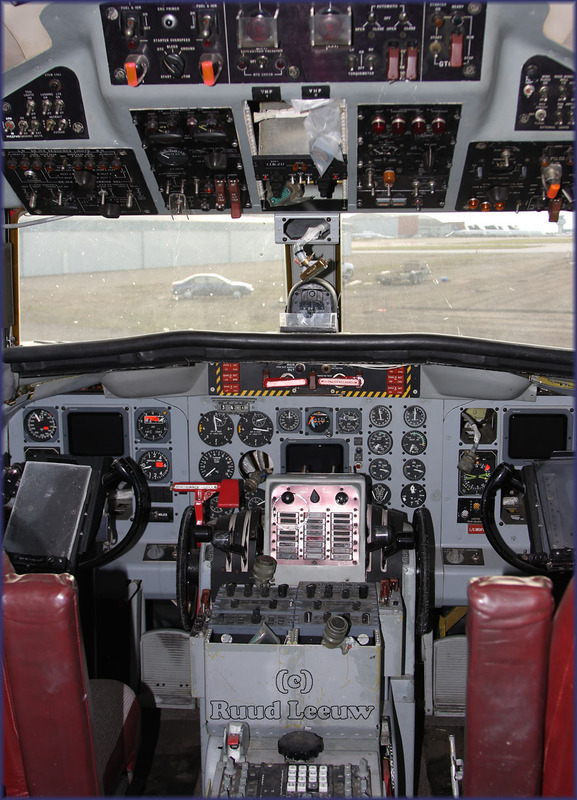 This is the last built Canadair Cosmopolitan, CL-66B-10, and it was to become C-GNCM. It started with the RCAF as 11160, later registered 109160 ('160' still adorns the aircraft) and this CC-109 was converted to CV580 standard too, in 1967. 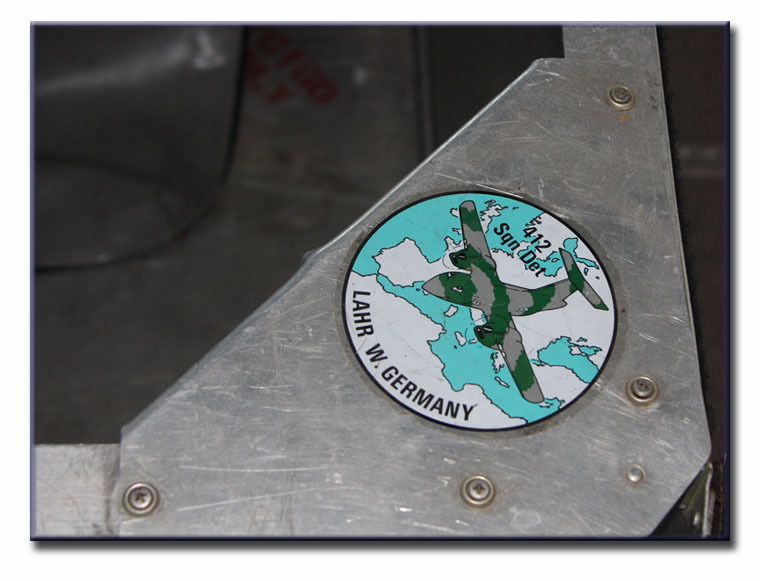 It flew with 412 Sqdn and its tailnumber was revised to 109160 on 26May70. Its military career ended in 1994, proclaimed 'wfu': without further use. As C-GNCM it was registered C-GNCM on 15Oct96, but this was cancelled again that same month. So it sits here: without further use. Pity that no.1 engine did find some use, elsewhere. But read on.. 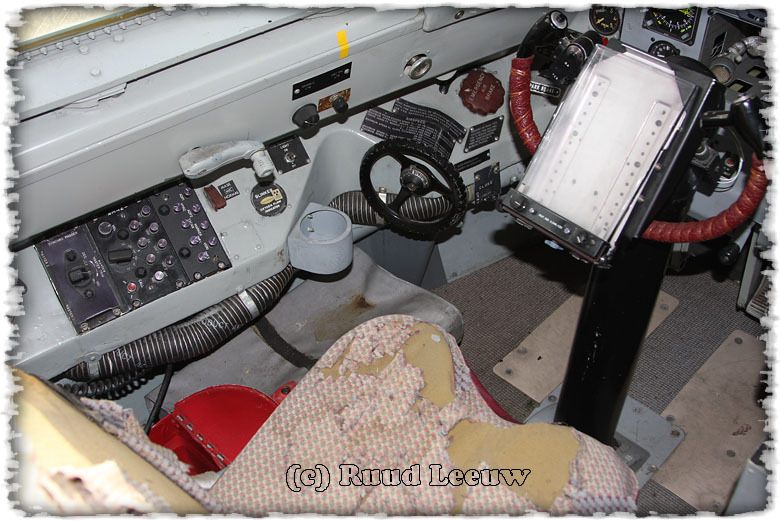 Some examples are C-47 to DC-3 and C-121 to L-1049 where the airframe built for a military customer will need a service bulletins performed to convert from military to standard civil. This SB will need to come from the original manufacturer or can be an STC which will need approval from the airworthiness authority of the country of original manufacture and subsequent acceptance by the country of registration. A half measure is 'limited' or 'restricted' but they are special purpose aircraft: waterbombers are one example as were also the C-119's in AK for government work. The military maintenance program is different from any civil program and the times between overhaul may be different... to perform 'catch- up' maintenance and modifications (or de-mods) to register as civil may not be financially viable. The Cosmo modification to Allison engines did NOT make it a CV580, as that can only apply to a Convair built airframe per the STC. 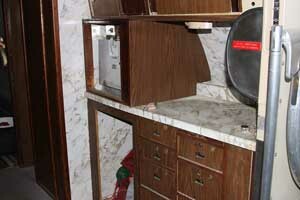 I would assume the details of work and part replacement was the same, however the DND (Dept. of National Defense) would have signed off the modifications under their own depot maintenance program and QA. I seem to remember that the Allison engines may have a military part number; if so, they cannot be legally transplanted onto a CV580, probably the reason these planes still have engines attached? The same issue applied to my Pembroke, it cannot be converted to a President as no SB exists and the OEM will not agree to some other company assuming design authorisation. 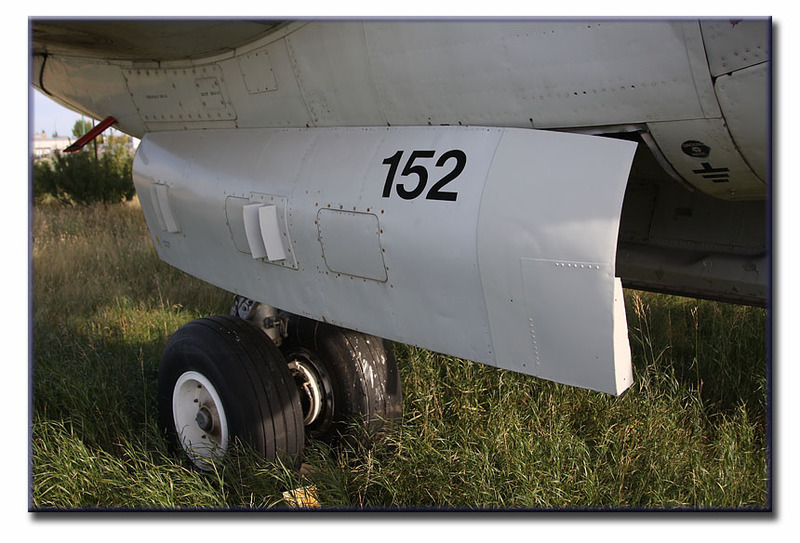 I seem to remember that a C-121 being converted to a 'standard'-certificate had to have the wingtip tank mount bolts changed, nothing wrong with them but the part number stamped on the bolt head was different between the military and civil aircraft... Same bolt though!" "Military airworthiness certification is typically based on civil certification; so in the case of the CC-109s, if Canadair had obtained a civil airworthiness certification for them, it would have been the basis for one from DND. 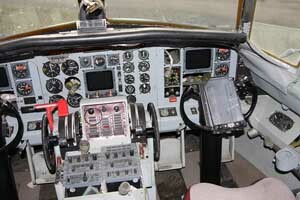 Since only ten were built, all for the RCAF, it is quite possible that there was no civil certification at that time. Even if the re-engined CC-109s had exactly matched the CV-580 standard when redelivered, there were countless changes to the aircraft between then and when they were withdrawn from use and each of those changes would have to be reviewed and approved by Transport Canada before they would issue an airworthiness certificate. That was a major problem when the CH-139 Jetrangers were to be put on the civil register and loaned to a contractor for basic helicopter flying training. People in Ottawa described it to me as the helicopters having been "drilled full of holes for this mod and that" and civil certification turned out to be a nightmare. It was obtained, but only because the aircraft remained in use by/for DND and I'm sure they'll never end up in civilian ownership. I mention this to illustrate the kind of factors that may have come into play with the Cosmos. 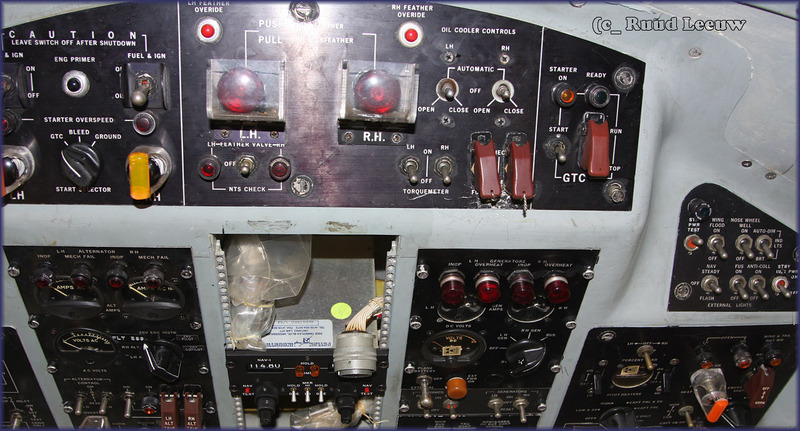 Regarding the re-engined CC-109s, I have seen numerous DND documents that listed them using the civilian model number for the Allison engines, not a military one. Although basically the same engine, similar documents listing the engines for the CC-130 and CP-140 (Lockheed P-3 version) used the military designation. I wonder if the CC-109's Allison engines were not GFE (Government Furnished Equipment) but rather were purchased by the contractor from its usual source and were therefore officially civilian versions..? " 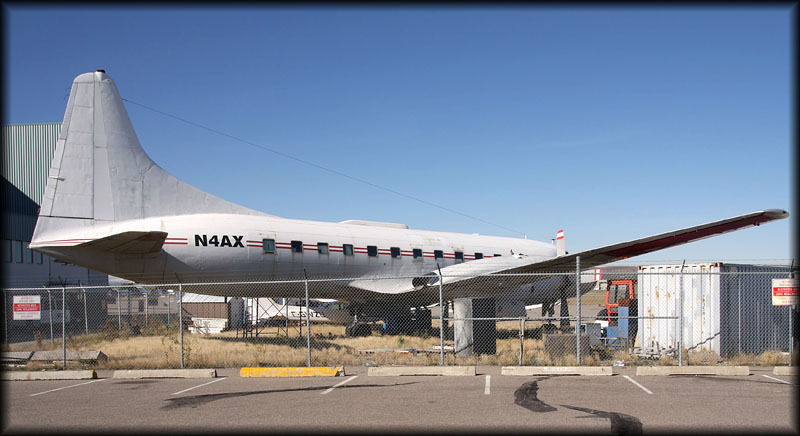 With a growing awareness for preservation, hopefully some museum will find use to include these aircraft in its inventory. One cannot state Canadair aircraft to be overrepresented in Canadian aviation museums..
(By the end of 2012 they had been ferried to Kelowna by KF; see update bottom page). RCAF 109160 left Saskatoon, to find a new home with Kelowna Flightcraft / KF Aerospace in British Columbia. Further details below. "I too suspect that at least one of the CC-109s that were in Africa have crossed over to Panama. I myself have had no luck with Aeroperlas in Panama -- they don't respond to my e-mails. What I do know is that they have ex-109157, now registered HP-1445 and in full Aeroperlas livery. Also, HP-1468 was photographed in Aeroperlas titles but with a modified ex-Canadian Forces livery (red lightning bolt trim). I suspect this aircraft might well be 3D-ZOE, ex-109156, ex-5Y-BNV, ex-9XR-NC. I also suspect that Aeroperlas has a third in service. A year ago I photographed one of the ex-Canadian Forces CC-109s at Saskatoon (CYXE, where all surviving seven were stored after purchase by Norcanair from the Canadian government), with the Panama registration HP-1473 (modified ex-Canadian forces livery, blue lightning bolt trim). I could not get any details on this airframe but it was obvious it was being prepared for a ferry flight. 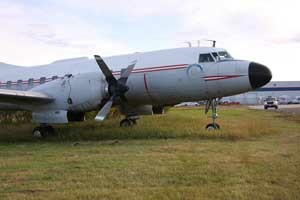 It was one of three airframes remaining at YXE. The three airframes are 109152, 159 and 160. 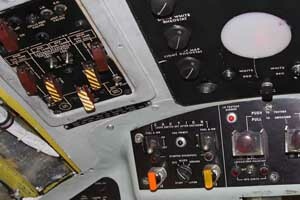 None of the airframes had any distinguishing markings so it is impossible to know which of the three HP-1473 might be. Another of the three I observed in 2002 had the same blue trim but it remains at YXE, along with a second still in basic CF colours but without engines. HP-1473 has gone, probably to join HP-1445 and HP-1468. In any event, nobody at YXE knows anything about the identities of the remaining airframes, or is willing to tell! I have corresponded with a spotter in Panama, who says the Cosmopolitans were bought because of their large freight door (not to mention their glass cockpits). He said HP-1445 was joined by second, which he thought was HP-1455. I haven't seen any evidence of this airframe but it does open up the possibility that four CC-109s are now in Panama. 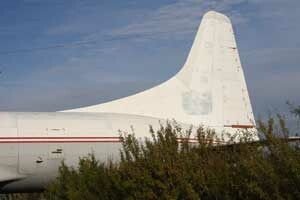 Perhaps it is 9XR-NB, ex-109154, which was last noted withdrawn from use at Lanseria, South Africa. That would add up to seven, since two remain at Saskatoon and a third is at Calgary (ex-109151, N4AX). Any ideas?" 109154 was delivered April 28, 1960 with s/n 11154, official handover to RCAF took place May 25. In 1960 re-engined by PackAero at Burbank, California, USA, with 3,750 eshp Allison 501-D13D turboprop engines (civil version of the military T56). 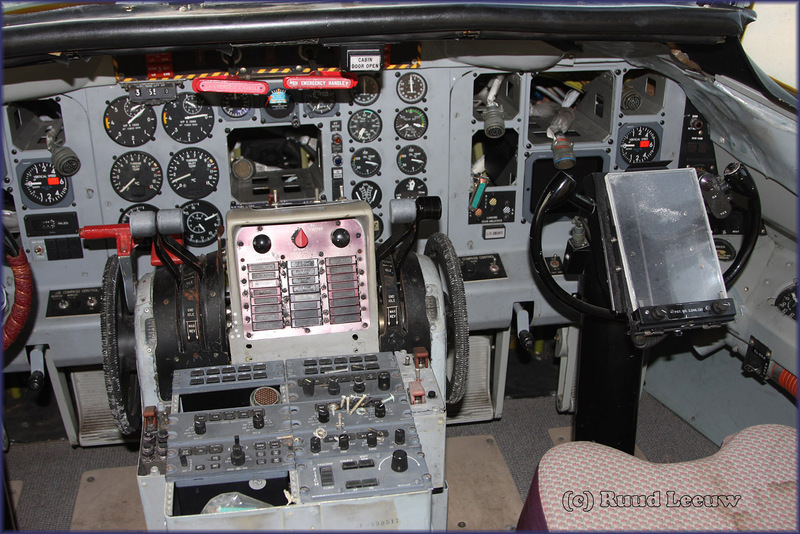 Renumbered 109154 when taken over by CAF on May 26, 1970, refurbished with VIP-interior November 16, 1973, withdrawn from use in June 1994 and stored at Air Maintenance Development Unit, CFB Trenton, Ontario. In 1995 on Canadian Registry as C-FNCT, to Albert Ethier, North Canada Air Limited (Norcanair), Saskatoon, Saskatchewan, stored July 1998. 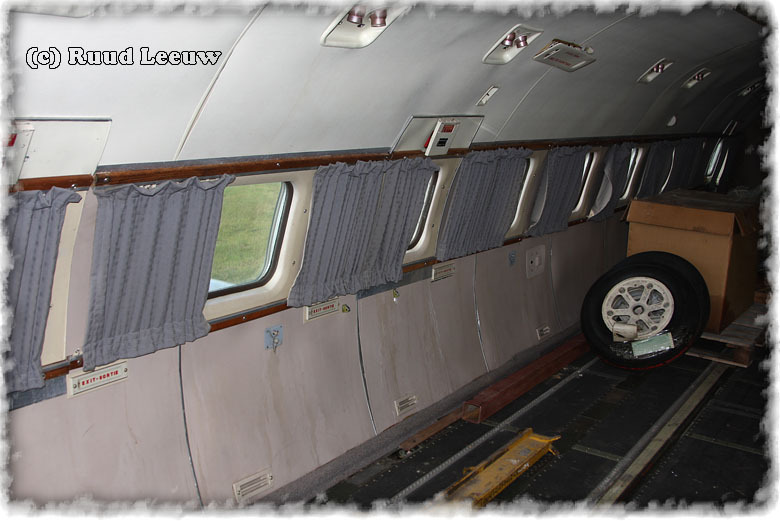 In February 2001 sold to Sankair International, Kongo as 9Q-CLU, on June 13, 2001 reregistered in Rwanda as 9XR-NB to Central African Cargo, Lanseria, South Africa, but not taken up, instead to Aeroperlas, Panama as HP-1468, subsequently as HP-1468A and HP-1468APP, while in storage at Panama City for longer period. Next it was registered to the lease-company Parwood Financial Corp, Caracas, Venezuela as YV-191T, from April 24, 2006, it was leased to TAM (Transporte Aereo Militar, Military Air Transport) ), civilian wing of the Fuerza Aerea Boliviana (Bolivian Air Force) at La Paz, with the serial FAB-74, reportedly at a rate of US$ 12,000 a month. This is taken from the CAF's Engineering Logistics Directive (ELD) for the CC-109 Cosmopolitan. 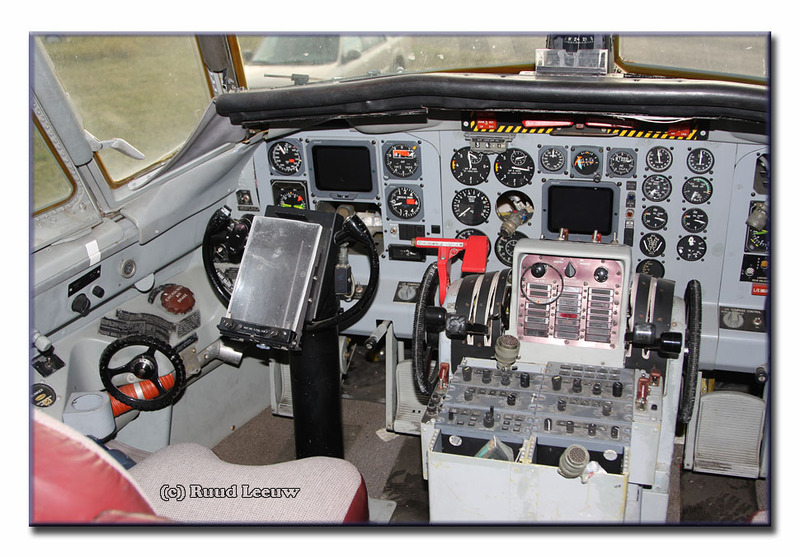 ELDs are used to develop and support an Estimated Life Expectancy (ELE) for an aircraft type and also in support of the Canadian Military Airworthiness Type Certificate (CMATC). 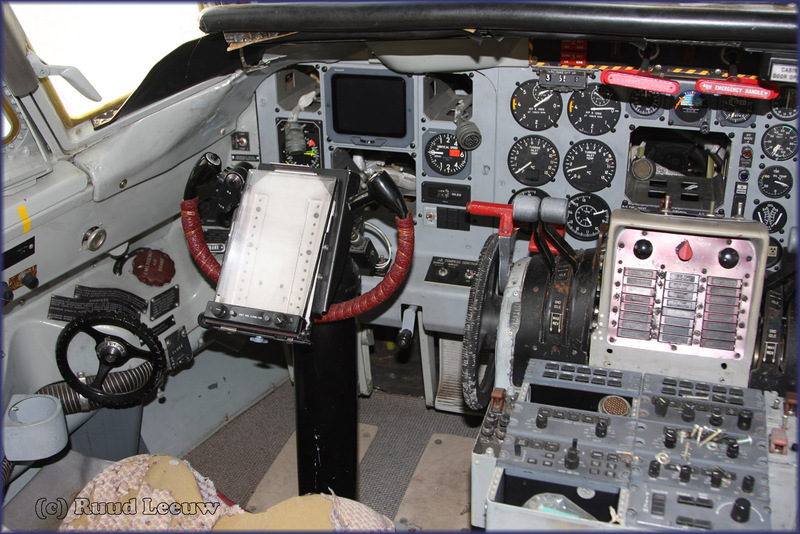 When they determine an ELE, it is based on what is known about all factors including current and planned flying annual hours, availaibility of spares (in-stock and for purchase), logistics and training requirements, fatigue life, known issues, and many other factors. 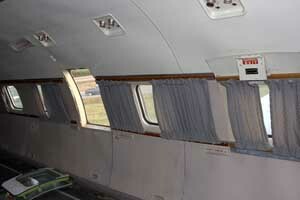 The CC-109 ELD is dated 20 December 1989. 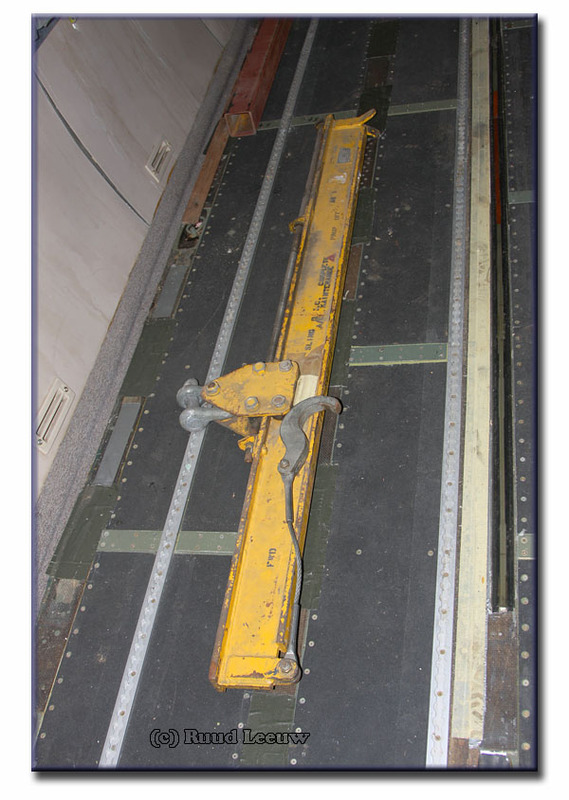 Under 'Manufacturer', it says, "The airframe was built by Canadair Limited of Montreal on jigs and fixtures transferred to Canadair from the Convair plant at San Diego. 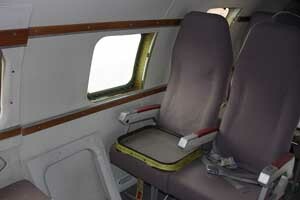 The aircraft were manufactured to Specifications AIR-19-12. The Service Model Designation is CC-109 and the Canadian Forces name is Cosmopolitan. 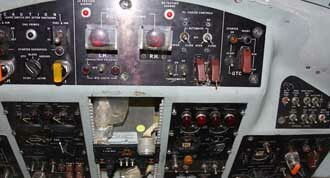 The Civil Designation is Convair 580." 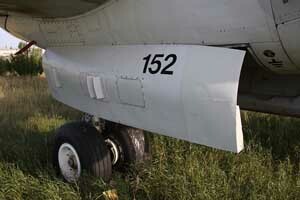 Under 'Power Plant', it says, "The aircraft is powered with two Allison 501-D36A prop-jet turbine engines. The engines are axial flow, internal combustion gas turbines delivering their power via a reduction gear to the propellor." Under 'Propellors', it says, "A Hamilton Standard 54H-60-91 four-bladed, full-feathering, reversible-pitch, electro-hydromatic propellor is installed on each engine. 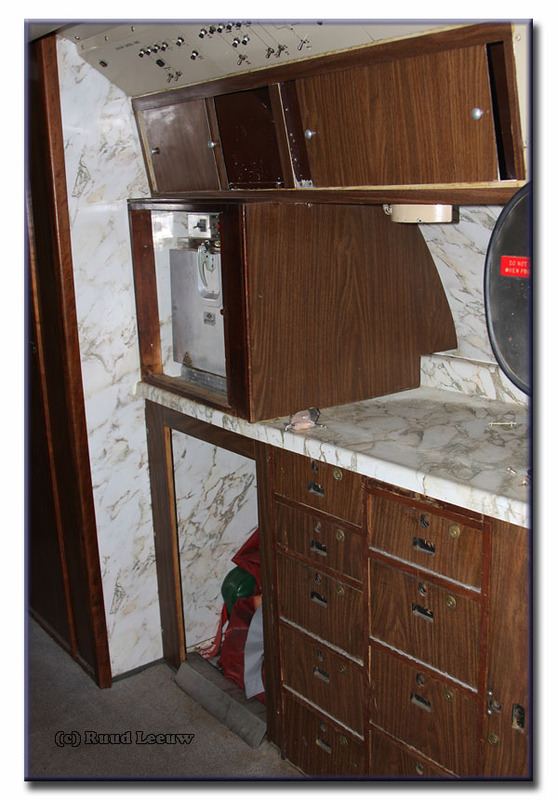 A control system is provided for maintaining constant speed, reversing, synchronizing, synchrophasing, and manual, automatic, and emergency feathering." Under 'Re-engining of CC-109 Aircraft', it says, "Due to the many and varied problems experienced in operating the Napier Eland engines, NDHQ authorized the re-engining of seven Cosmopolitan CC-109 aircraft with Allison 501-D36A engines (commercial version of Allison T56 type engine) turning Hamilton Standard 54H-60-91 propellors." What is that protruding part underneath the fuselage? 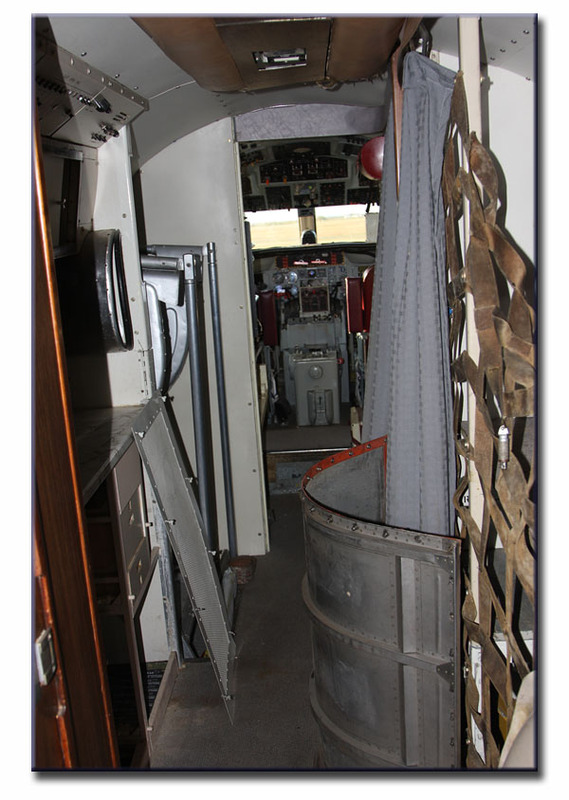 Chris Trott cleared this up for me: "that 'thing' (see correction by Al Furneaux) projecting from under the fuselage is the Air Cycle Machine inlet. 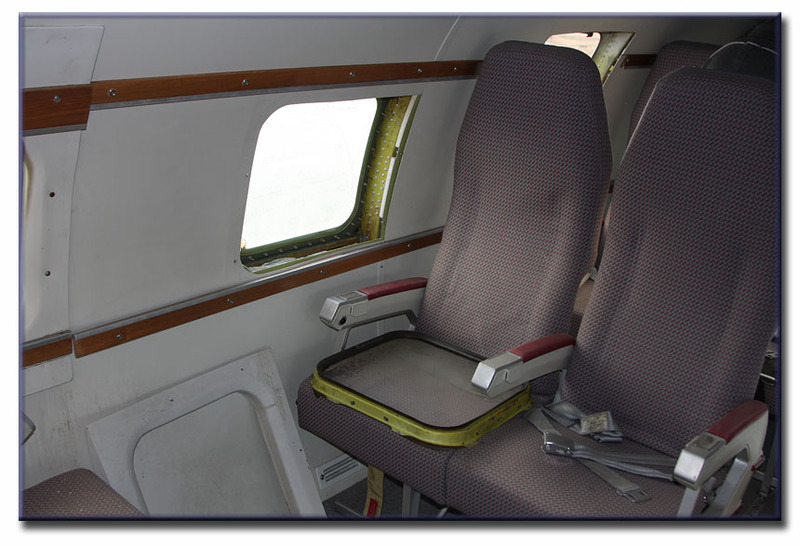 Basically, this is the inlet for air to pressurize the cabin and the ACM also can cool and heat the air using bleed air off the engine." 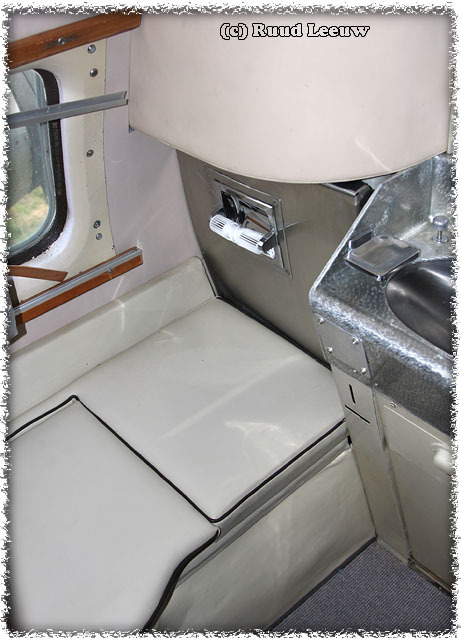 Al Furneaux wrote (Jan.2013): "The cabin is pressurized by an Engine Driven Compressor (EDC) on the # 2 engine, not bleed air. 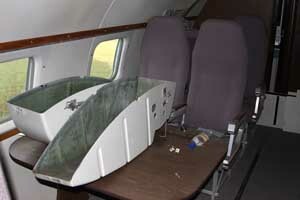 The inlet under the fuselage supplies cooling air over the 'Secondary Heat Exchanger'. It has nothing to do with the ACM. 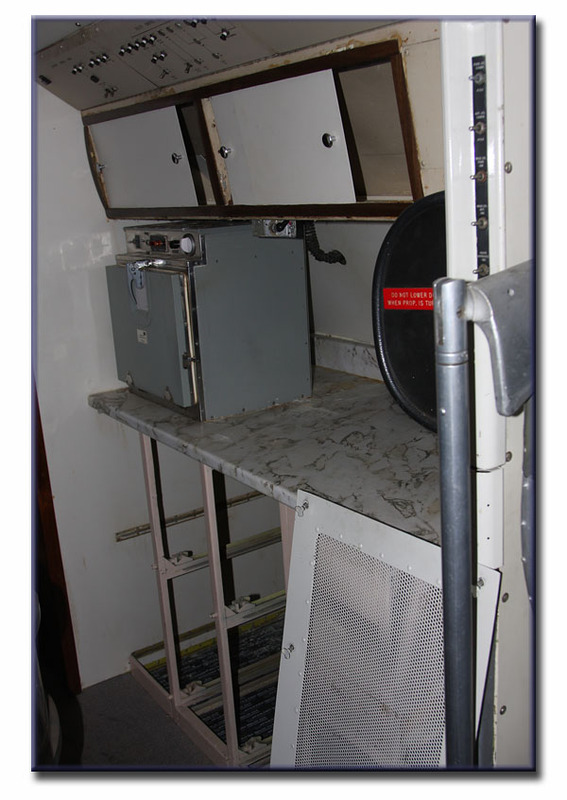 The Air Cycle Machine does help cool the pressurized air." "These Cosmo’s here were recently sold! Kelowna Flightcraft purchased them all and they ferried the two out (after a little work), probably to Kelowna,B.C. Perhaps they will turn them into waterbombers?. I think they’re trying to get the other ones back from wherever they are as well; one was in Calgary and two more were in Panama or somewhere in Central- or South America..?" Flighttracker flightaware.com showed a two hour ferry flight for ('C-GNDK') from Saskatoon (CYXE) to Kelowna (CYLW) on Oct.12th 2011, but this tailnumber doesn't match the C-reg's once reserved for them (FNCL & GNCM). "This C-GNDK found by Brian is a so-called 'special mark', a kind of provisional registration that is issued for only one year. These special marks are unfortunately not included in the regular register, and will therefore never show up online. The CL-66 registrations in 1996 (C-FNCI/CL/CT/CV/CW and C-GNCB/CM) were also special marks. I did some further research on the Saskatoon CL-66s (with the help of Bobbie Rawlings and Terry Judge), and found the following. 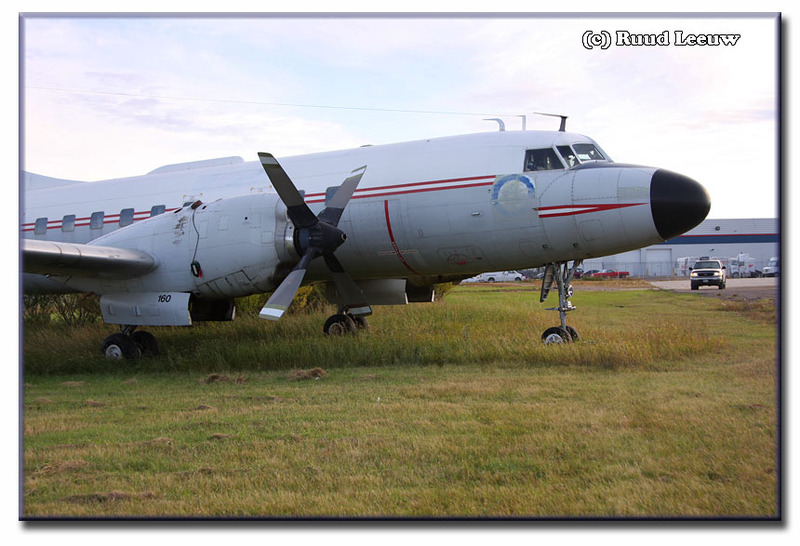 The first one flown out of Saskatoon was the former 109152 c/n CL-66B-2 (issued the special mark C-FNCL in 1996). On 29 Aug 2011 it was issued the special mark C-GLWF, and with that it was flown from Saskatoon to Kelowna on 01 Sep 2011. The second one was the former 109160 c/n CL-66B-10 (issued special mark C-GNCM in 1996 but never used). As Brian already found out via FlightAware, it was now issued special mark C-GNDK, on 06 Oct 2011 to Kelowna Flightcraft Ltd. to be exact. 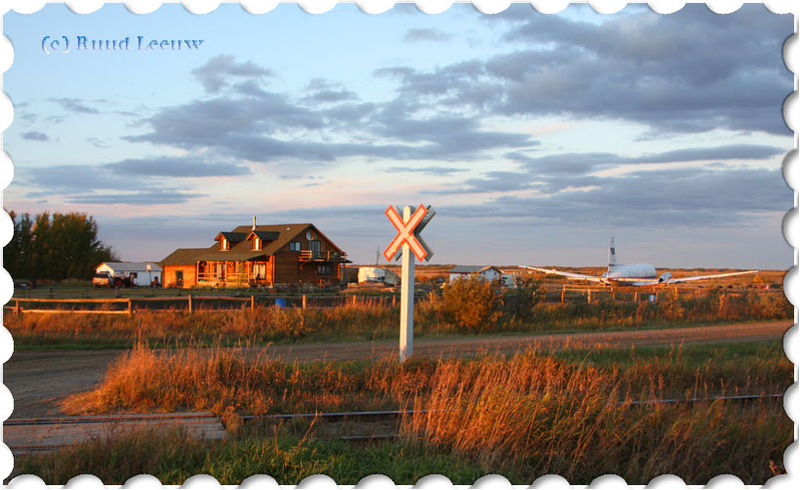 As FlightAware shows it was then flown from Saskatoon to Kelowna on 12 Oct 2011. All in all a nice development, I wonder what Kelowna intends to do with them. 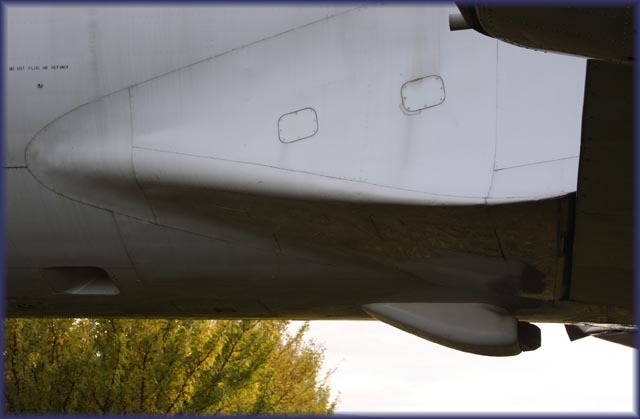 Spares use, or conversion to airtanker? 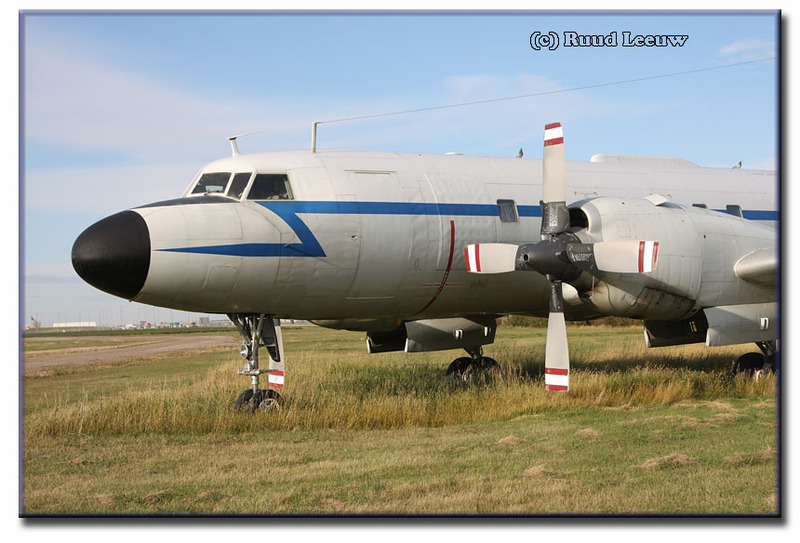 If airtanker conversion, then hopefully they will also acquire the one in storage at Calgary since 1996 (N4AX), and possibly even the one stored in Bolivia (FAB-74) and the duo stored in Panama (HP-1445/1473)." 'With the economic challenges the world has faced over the last 2 years, it has brought many opportunities for KF to make purchases at a considerable discount. Fortunately, with cash in the bank, we have been able to take advantage of a number of opportunities as many people and organizations are in need of cash to remain viable. Most are not even designed for a quick buck for us -- they are longer term designed. That certainly applies to our purchases over the last year of the Ecuadorian Buffalo, Jay Dee inventory, Cosmos and associated inventory in Saskatoon and Panama, and even a couple more DC-10s. 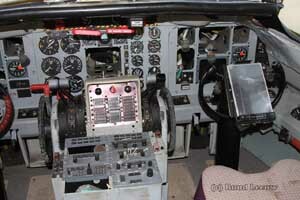 All of these purchases will help us support our Convair customers and our own fleets for years to come. Nov.2011: Kelowna Flightcraft confirmed to me (RL, webmaster) that KF "..indeed purchased the Saskatoon, Calgary, and Panama Cosmo aircraft (5 total) and will be bringing them all 'home' to Kelowna, BC. Two are here now. First choice will be to utilize the air frames back in service - possible as Air Tankers. 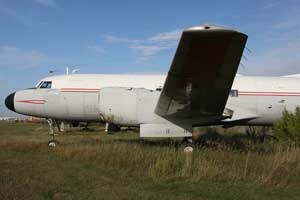 Failing that, they will be utilized for parts to support the Convair fleet worldwide." "I had the honor and pleasure to ferry all 5 Cosmos to Kelowna. 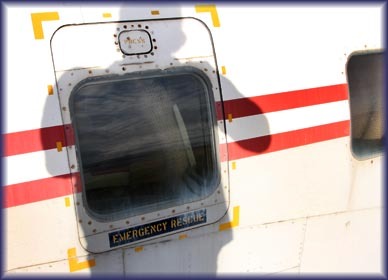 11152 (C-GLWF) 11 Dec 2011 – Saskatoon to Kelowna, with the help of Capt. Mike Coulthard and Trevor Mcleod (Avionics). 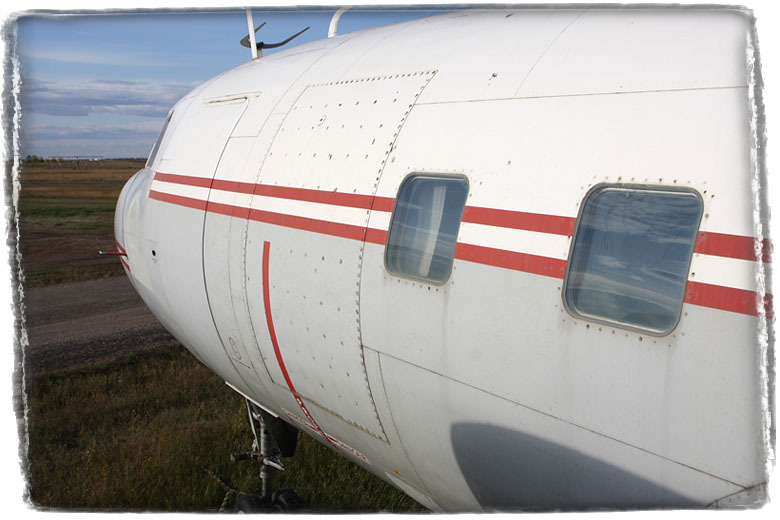 11160 (C-GNDK) 12 Oct 2011 – Saskatoon to Kelowna, with the help of Capt.Terry Chan and Trevor Mcleod (Avionics). 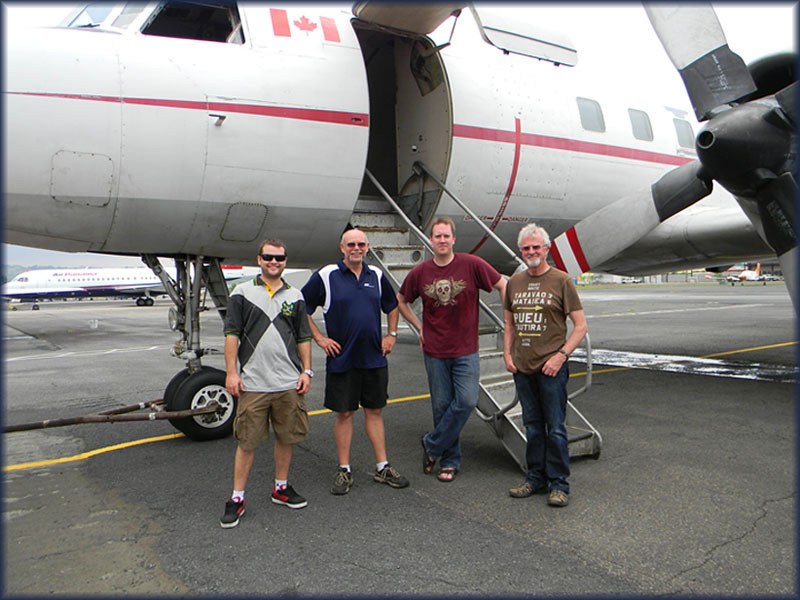 11157 (C-GPQY) 03 May 2012 – Panama to Kelowna, with the help of F/O Ryan Best, Trevor Mcleod (Avionics) and Kirk Biccum (Maintenance). Total ferry time was 1 ½ days. 11159 (C-GTVJ) 20 Sept 2012 - Panama to Kelowna, with the help of F/O Ryan Best, Trevor Mcleod (Avionics) and Doug England (Maintenance). Total ferry time was 1 ½ days. 11151 (C-GULQ) 11 Dec 2012 – Calgary to Kelowna, with the help of Capt. Mitch Martens, Trevor Mcleod (Avionics) and Shawn Wolfe (Maintenance). My thanks to Trevor and the maintenance crew for keeping us safe. Thanks to Ryan Best for his dedication and hard work on the Panama trips, Denise Tateyama for her help with logistics. Mike Winterman, who was in charge of the Cosmo’s recovery." 11157 ready to depart Albrook airport Panama: Trevor, Kirk, Ryan and Al Furneaux. - Allocated C-GULQ to Kelowna Flightcraft Ltd. (Kelowna, BC) on 26 Nov 2012. - Flown from Calgary to Kelowna 11 Dec 2012 and stored. - Allocated C-GLWF to Kelowna Flightcraft Ltd. (Kelowna, BC) on 29 Aug 2011. - Flown from Saskatoon to Kelowna 01 Sep 2011 and stored. - Allocated C-GPQY to Kelowna Flightcraft Ltd. (Kelowna, BC) on 19 Apr 2012. - Flown from Panama City to Kelowna, arrived there 03 May 2012. Stored. - Allocated C-GTVJ to Kelowna Flightcraft Ltd. (Kelowna, BC) on 07 Sep 2012. - Flown from Panama City to Kelowna, arrived there 20 Sep 2012. Stored. - Allocated C-GNDK to Kelowna Flightcraft Ltd. (Kelowna, BC) on 06 Oct 2011. - Flown from Saskatoon to Kelowna 12 Oct 2011 and stored. Also noted at Kelowna, 06Jun16. Added note- all five C-regs are what Transport Canada calls 'special marks', a kind of provisional registration issued for only one year. They are mostly used for test and/or delivery flights, often for one flight only. These special marks are unfortunately not included in the regular civil aircraft register, and they will therefore not show up in TC's online database. 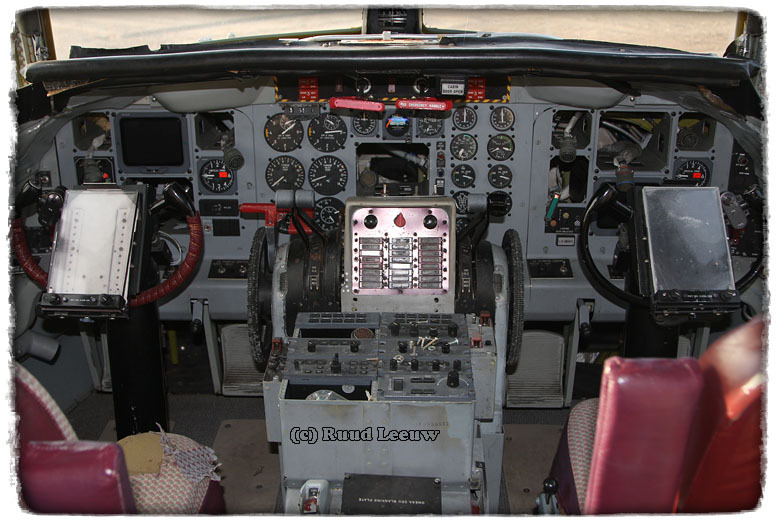 Cory Rousell took the unusual initiative to preserve an aircraft in his own backyard... Obviously, he has the space to do so! He lives with his family a considerable distance out of town and when I got there I had to move quickly to shoot my photos with fast diminishing daylight.